Loaded Mashed Cauliflower | Louisiana Grown | Real. Fresh. Preheat oven to 350 F. Cut up cauliflower. Cook the cauliflower in a large pot with a little bit of water until a fork can easily go through the stems. Drain it once it's cooked. Put the cauliflower back in the pot, then add milk, sour cream, and goat cheese. Mash with a potato masher for a chunky texture, or transfer to a food processor or blender to process until smooth. Transfer to a baking dish. 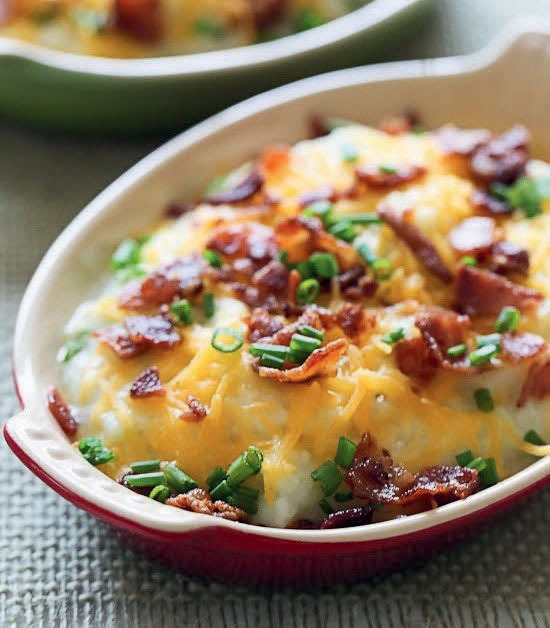 Top with chopped bacon, green onions, and cheddar cheese. Bake in oven 8-10 minutes until cheese topping is melted.